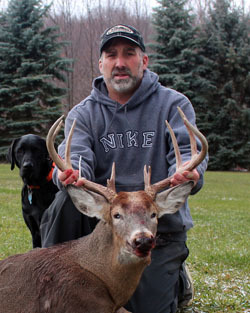 More of the bigger 2012 New York Whitetails. 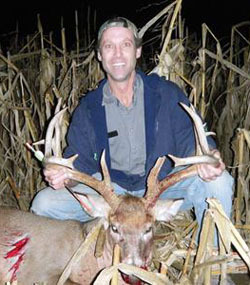 If you or someone you know has a nice buck that you'd like to showoff. Just email a quality pic to nyantler@twcny.rr.com and I will add it to the page. 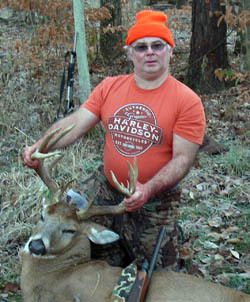 Don Gearing took this 11-point buck on opening day of shotgun season. 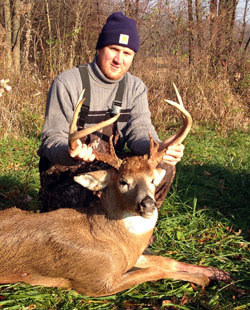 His buck was taken on the Rattlesnake Hill State Wildlife Management Area in Livingston County. Father and Daughter each take a buck in 2012. 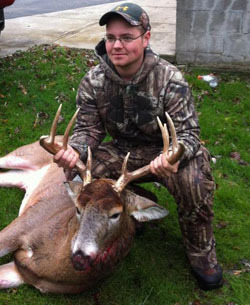 Matt Olles - 8-point on 11/17/12 in Genesee County, Elba, NY. The buck has a 23 1/2 inch spread. 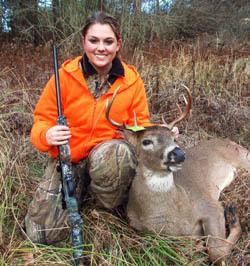 Hailey Olles - took this 8-point on 12/1/12 in Genesee County, Elba, NY. 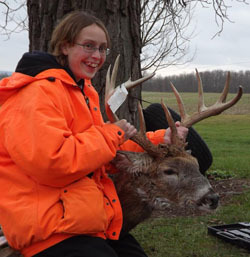 This was her second year hunting and her first buck. 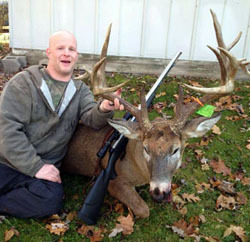 This giant 15-point was taken by Vance Carr in Clyde, NY-Wayne County on 11/19/2012. 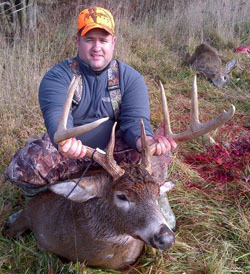 Jon Stalica arrowed this buck in Genesee County. 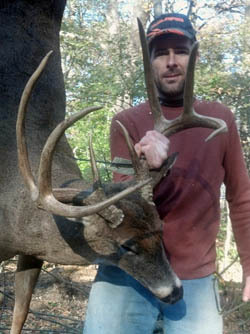 Greg Tellone arrowed this giant Long Island 8-pointer on 11/03/2012. 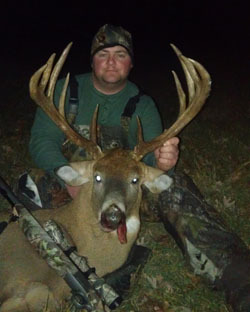 The buck weighed a whopping 232 pounds and unofficially scored 171" with 25- 4/8" main beams and 14-4/8" G2s. 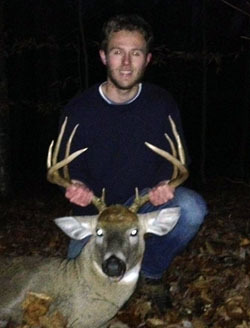 Taken by Nick Ringelberg in Dansville NY - WMU 9p - Steuben County on 11/24/2012, 170 yard shot with a muzzleloader. Gross green score 160 3/8” net green score 154 4/8”. Deer is only 3.5yrs old. 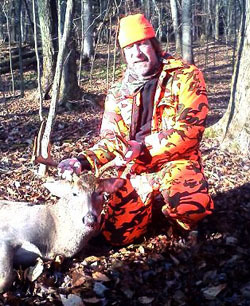 Shot opening day by Tom Thomas on his own woods in Granger,NY - Allegany County. Used a Marlin Lever action 44 mag. at about 20 yards. 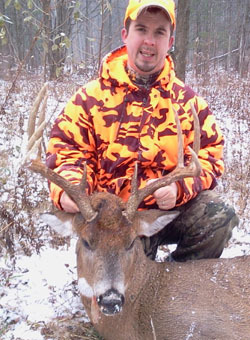 9-point that weighed just under 200 lbs. 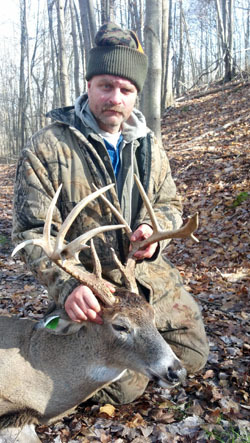 This buck was taken by Dan Havert on opening day of gun season 2012 in Wayne County, Town of Marion, NY at 8:30 am. 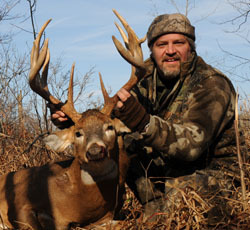 The buck has a 17 ½" spread, weighed 165lbs and has split brow tine on the left, very neat antler bases. 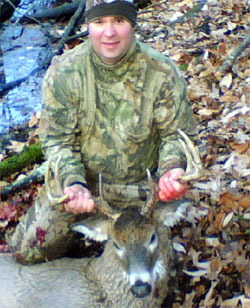 Chad Steward with his Chautauqua County 8-point gross score 140"
14-point.Taken by Chris Nelson on 11/18/12 in Clarendon N.Y.
" The one I thought I missed. But, thanks to my friend Terry we tracked it four hours later,after finding no blood trail at first. Found it 1/2 mile away." 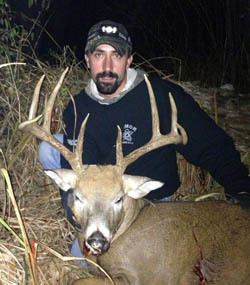 Travis Defalco with his biggest gun deer to date an 8-pointer taken 11/19/2012 in Sullivan County. 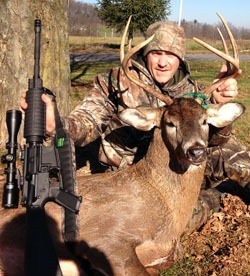 10-point taken on Opening Day of gun season 2012 in Middleburgh, NY- Schoharie County by Len Duckman. 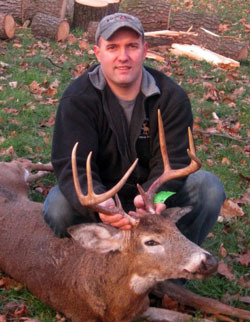 Matt Bramer with his Montgomery County buck taken 11/22/12. 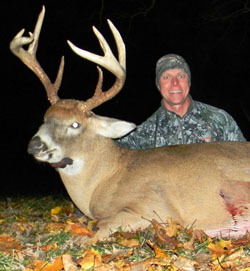 The buck weighed 152 lbs dressed and was taken with an AR-15 6.8 spc 110 grain. 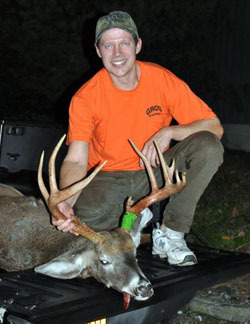 Nickolas Optis poses with his 12-point taken November 17, 2012 opening day of gun season in Springwater, NY - Livingston County. The buck was aged at 5-1/2 years old and weighed 233 lbs. 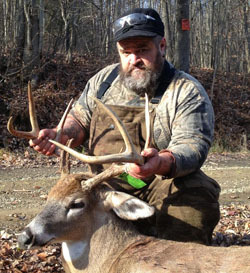 Kevin Aucompaugh with his 10-point taken in Montgomery County on 11/18/12 with 30-06 at 295 yards.The buck dressed out at 170 lbs with a 19-1/4" spread. 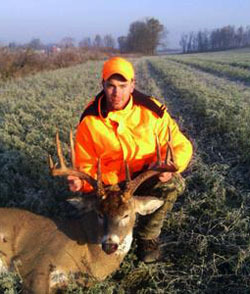 Ross Lawton and his 9-point shot 11/25/2012 in the Town of Locke, Cayuga County. 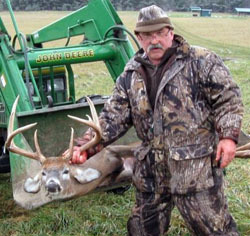 The buck was weighed and aged by the DEC at 160 lbs and 4.5 years old. 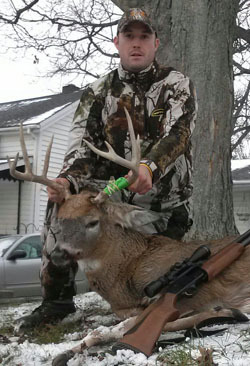 Spencer VanAlstyne and his Fulton County10-point. 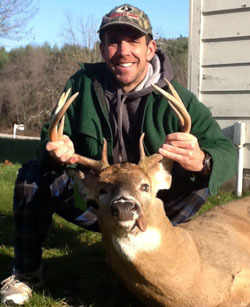 David Gerardi harvested this nice 195 pound 10-point in Saratoga County. 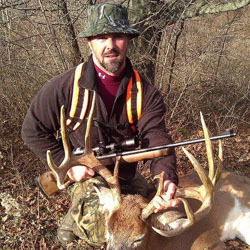 Ten pointer, shot on 10/25/12 by Russell Anderson in the Town of Chester, Warren County during rifle season. Dressed out at 165 lb. 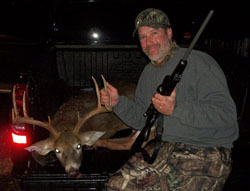 Western N.Y. 11-point shot by Jim Clark in Wyoming County during the 2012 gun season. 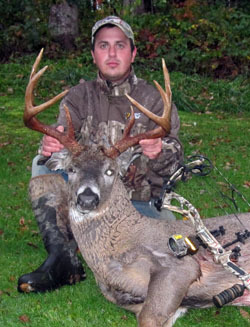 Matt Palumbo shot this 8-point, 202.5 lbs buck with his Remington 750 30-06 at 40 yards. 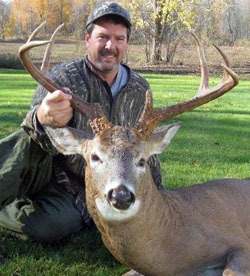 The buck was taken in Herkimer County.